Dior Vernis Be Dior ($27; sephora.com), is one of four limited edition shades launched along with the newly re-formulated Dior Addict Lipstick Collection. 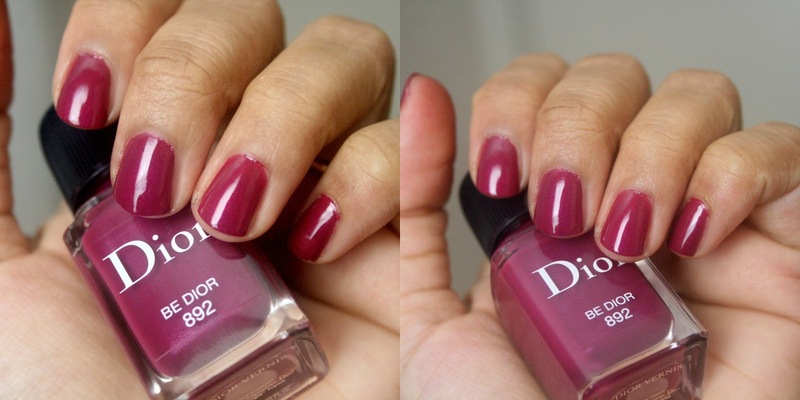 Be Dior is a gorgeous purple with very fine shimmer, in Dior’s fabulous gel-like formula and smooth, wide brush. Be Dior was almost perfect, consistency wise and went on without any streaks or bubbles. It dried rather quickly and also looked pretty shiny without a top coat, but I added one anyway for longevity. The fine shimmer although not really visible, does add a little something extra to the polish. The formula was completely opaque in two thin coats and wore a good 3 days on me without chipping much with very minimal tip wear. I thought the color might be similar to Mirage from Dior’s permanent range of colors and hesitated picking it up initially, but Be Dior is deeper, more purple and quite unique to my collection. Definitely a color worth picking up if you like Dior’s formula and want something that you could just wear all through the fall season! Such a gorgeous shade. I love how it looks on your nails.